Both Ecowarm RadiantBoard and Warmboard R are great solutions for a high performing, quick responding radiant floor heating system. We have made design and material choices that we think better serve the marketplace. We have been manufacturing nonstructural radiant heating boards for 18 years and the Ecowarm RadiantBoard product line for 6 years. Warmboard originally sold structural Warmboard S product but more recently developed the nonstructural Warmboard R, imitating our design. Ecowarm RadiantBoard offers high quality, sustainably forested 6 or 7-ply FSC® certified plywood made in the USA. Warmboard R uses oriented strand board (OSB) from Canada, a substantially less expensive, not-sustainably certified and generally less desirable substrate for flooring. Ecowarm RadiantBoard uses a thickness of aluminum laminate appropriate for the heat loads experienced in modern homes (more below). Our high recycled content aluminum is laminated using with a super strong water-based No VOC adhesive. Warmboard uses aluminum twice a thick as Ecowarm RadiantBoard which we think is excessive. Ecowarm RadiantBoard is typically 35% less costly than Warmboard R or Warmboard S, for that matter. Warmboard R remains more expensive than Ecowarm RadiantBoard, we think because it uses the company’s existing over-engineered aluminum plates adopted from their structural board Warmboard S. On the other hand, their OSB board is less costly than our plywood. Warmboard, through their in-house sales videos, attempt to show the vast superiority of their products performance over all other radiant products. In our case, this is simply not the case. In the radiant heating industry, efficiency is described by measuring the steady-state performance of a system and, separately, the response rate of a system. 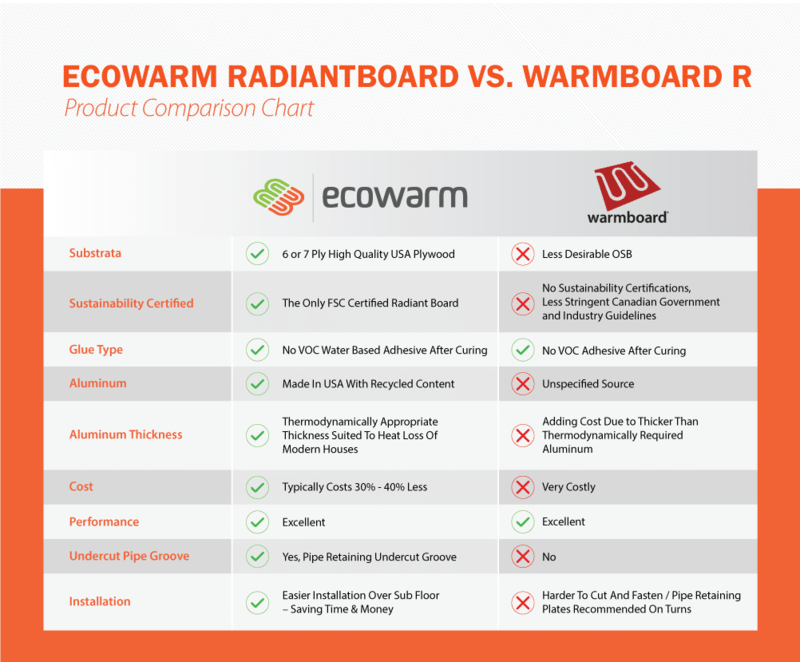 Both Warmboard R and Ecowarm RadiantBoard are top performing systems as demonstrated in the published data of both companies and independent testing. This is the metric that almost all radiant manufacturers publish to demonstrate the efficiency of a radiant system using different heat delivery methods (concrete, gypsum pour, underfloor, Ecowarm RadiantBoard, etc). The temperature of the supply water required to meet a specific heat output to the room demonstrates the efficiency of a system; the lower water temperature the better, resulting in lower operational costs. Almost all of a radiant system heating season is spent cycling through a steady state condition, so this data point is important. Ecowarm RadiantBoard requires very low temperatures to meet steady-state heat loads. Warmboard company steady state performance chart indicates they might require a supply water temperature slightly lower than Ecowarm RadiantBoard in common heat load conditions. Independent testing by Virginia Tech of many system types shows Warmboard and our product extremely close in performance. Vast Superiority? Warmboard conflates their systems excellent responsiveness with efficiency, which is not consistent with the understanding of the radiant industry engineering community. Good responsiveness is very useful… hyperresponsiveness promoted by Warmboard has only a marginal effect on the actual performance of real-life radiant systems. Why? Their in-house testing protocol promoted in their sales videos, used by no other manufacturer in the industry, demonstrate a system floor starting from stone cold (0 BTUs) to a high heat load condition for most modern homes (20 BTU Sq Ft.), using a high supply water temperature (120F) rarely required in modern homes. In the real world, very little operating time exists under these conditions: starting up your system and shutting it down. During the heating season, a radiant system is cycling to maintain the temperature in a room or from setback, not going from stone cold. So the condition they should show is a system coming from setback, let’s say 15 btu/sq./ft to the 20 btu/sq./ft. in their videos. There is not a long lag time they demonstrate in a real system, particularly a responsive system like Ecowarm RadiantBoard. The Warmboard testing videos describe conditions with on/off radiant system controls popular 20 years, not what is installed today. Modern, well-designed radiant heating systems use weather responsive controls that anticipate changing weather conditions and change the system water temperature to maintain constant, comfortable room temperature. These types of controls also save the customer another 20% in heating costs. Systems now use setback and smart thermostats that save energy. A good response is very useful but hyper responsiveness just does not provide meaningful, cost-effective value or greater comfort in a modern radiant system. While Warmboard refers to their system as a high performance, hi-speed race car, a more fitting analogy is that Warmboard represents an expensive 200 mph sports car that is operated in a 60mph speed zone. 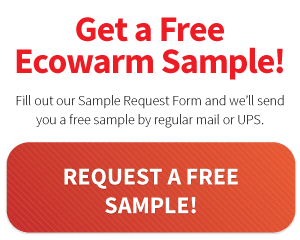 Despite claims by Warmboard, Ecowarm RadiantBoard should not create hot and cold spots on a floor that can be felt by people. In the Ecowarm RadiantBoard images below, cross hairs indicate the low and the high surface temperature across the board. You can also see the 3 temperature sensors we used to confirm the temperatures revealed by the thermographic camera. Note the very modest 2.8° F difference between the high and low temperatures across the Ecowarm RadiantBoard, confirming evenly distributed heat at 15 btu/hr per square foot using 115F supply water. On the other hand, Warmboard sales videos demonstrate stripping conditions with high supply water temperatures, not seen in well-designed modern homes…. to demonstrate a problem that should not exist. Both Warmboard and Ecowarm RadiantBoard provide even, comfortable heat across a floor. Ecowarm RadiantBoard is available as FSC certified. Warmboard R is not. Ecowarm RadiantBoard uses FSC certified plywood. FSC certification means our product is made from wood grown in sustainably managed forests with a monitored chain of custody. You know what you are getting. The OSB used by Warmboard R comes from Canada which has sustainability guidelines, not certifications. Additionally, it is impossible to track the provenance of a strand of OSB. Ecowarm RadiantBoard uses aluminum thick enough for effective heat transfer. Warmboard R uses thicker aluminum due to structural strength issue with their original structural product, Warmboard S. Both Ecowarm and Warmboard use no VOC adhesives for attaching the aluminum laminate. Hardwood can be glued directly to Ecowarm RadiantBoard and Warmboard R.
Ecowarm RadiantBoard use of sustainably forested substrata, No VOC glue, aluminum with recycled content, and a thermodynamically appropriate thickness of aluminum means Ecowarm RadiantBoard has a significantly lower impact on the planet than Warmboard R.
The thicker aluminum used by Warmboard makes cutting much more difficult on the blades and the contractor. Installers complain of damaged saws and gashes caused by the very sharp edges. Ecowarm RadiantBoard panels are lighter, making them easier to cut and place. As the curved combo sections of Ecowarm are serrated, a mallet or heavy roller can be used to pound the tubing in place.